Hanukkah starts on the late side this year (first candle Dec. 24), but it’s not too early to start thinking about Hanukkah music. You can hear my Hanukkah “carol” on Aaron Myers’ holiday album Snowing In Vegas. I created a video for the song this year to help spread the light. Enjoy! Just in time for the holidays, you can purchase the Aaron Myers holiday album “Snowing In Vegas” on CD. It’s a collection of fun seasonal music, and features three of my original songs, including the new DC classic “Stand Right”. You can buy the CD on this site for only $10 (plus $1 for US shipping). I listened to this tens of times while making the video, and it just doesn’t get old. It’s a beautiful song that I hope will take its rightful place in the library of American holiday classics. “Snowing In Vegas” now on Spotify! The Aaron Myers holiday album “Snowing In Vegas” is now available on Spotify. The album features Aaron’s new holiday classic “Love All Year, three of my original compositions (“Hanukkah Light”, “Snow Day”, and “Stand Right”) plus the fun original title tune “It’s Snowing In Vegas”. Enjoy! Celebrating Hanukkah with new holiday songs! Tonight we celebrated the first night of Hanukkah and the release of the holiday album I recorded with the superb Washington, DC vocalist Aaron Myers, “Snowing In Vegas.” While lighting the candles, we played my composition “Hanukkah Light” from the album, honoring the Hanukkah lights that warm our hearts and fight back the winter darkness. I hope you enjoy our music throughout the holiday season and in every season. Best wishes for a happy and healthy 2016. For this year’s rare confluence of Thanksgiving and Hanukkah, I offer my musical tributes to both holidays, performed here by Barbara Papendorp and Russwin Francisco. Happy Thanksgiving, Happy Hanukkah, Hag Urim Sameach, and best wishes for a warm and peaceful winter season. 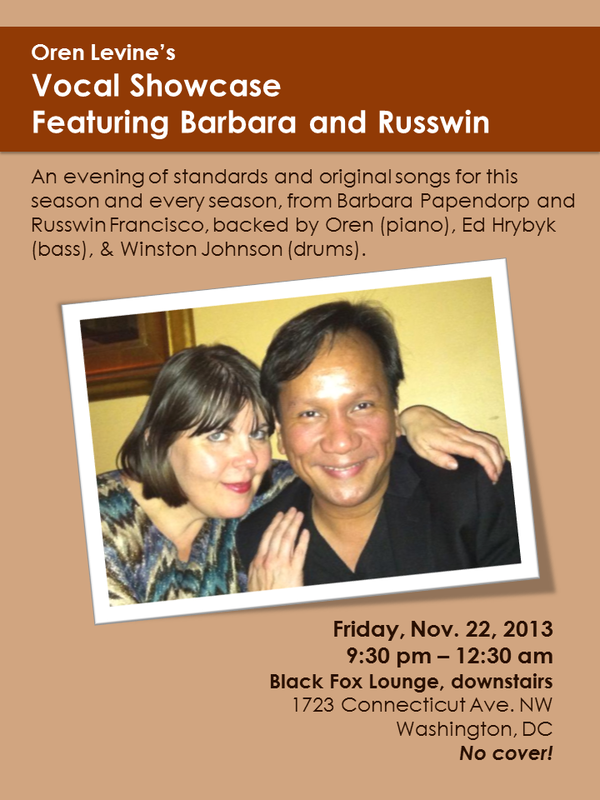 Looking forward to tonight’s exciting vocal showcase at the Black Fox Lounge, with Barbara Papendorp and Russwin Fransisco singing, and Ed Hrybyk (bass) and Winston Johnson (drums) joining me in the band. We have a bunch of new songs on tonight’s program, including holiday tributes to both Thanksgiving and Hanukkah, in honor of the rare concurrence of both of those holidays this year. Hope you can come out to share the music! Update (Dec. 20): here’s the sheet music for this tune (also on the Original Music page), in case you’d like to learn the tune. Hanukkah sameach! חנוכה שמח!